In 1962, Bell Radio-Tv entered into an agreement with Yaou Radio Mfg. Co. Ltd. of Japan to assemble several of their 'General' brand radio models. The General brand was extended across much of the line. 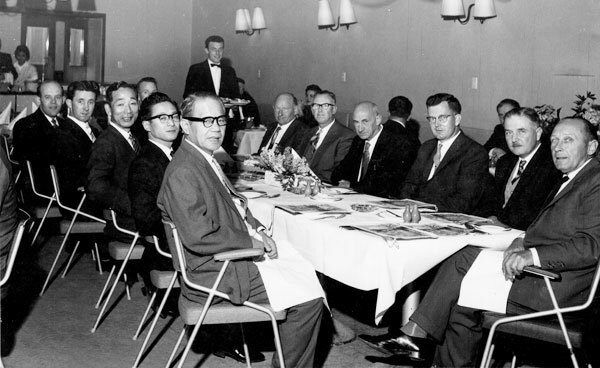 In June 1962 Bell Radio-Tv hosted a dinner in New Zealand attended by three Yaou Radio Mfg. Co. executives for the launch of the General range of products. Clockwise from front left: Mr Yao (Chairman, General Radio Japan); Mr Kono (Overseas Sales Manager); Mr Terasaki (Sales Manager); ?? (Bell Sales Manager); Axel Wozniac (Bell Purchasing Manager); at rear: Cliff Maxwell (Bell Chief Engineer); Bob McNamara (Chairman, Precision Press Products); Len Stockwell (Production Manager); Cliff Billing (Production Manager, Precision Press); George Whiterod (Bell Company Secretary); Lou Reindler (General Manager. Bell); Al Bell (Chairman, Bell Radio-Tv). Today Yaou Radio Mfg., Co., Ltd has transformed into Fujitsu General. They started making Air Conditioning units in the late 60s expanding sales into Asia and changing the company name to General Co. Ltd., which subsequently became Fujitsu General. Mr. Keijiro Yao (1899-1967) established Yao Shoten (Yao Trading) in 1924 in Tokyo. He changed his company name into Yaou Shoten in 1929. He had a great success with phonographs and record business in 1930's. However, in 1937, manufacturing of phonographs was suspended by the war. He changed his business from phonographs into radio in 1938. First brand was "Seikwa" (meaning the flower). Mr. Yao changed his company name into Yaou Radio Manufacturing Co. Ltd (YRC). In 1941. After the war, in 1946, new brand "General" started. Yaou Radio Mfg. grew up rapidly. In early 1950's, Yaou ended up to be one of the Japanese top three radio manufacturer after Matsushita and Sharp. In 1951, Home appliance division started. In 1955, company name changed to Yaou Electric Co., Ltd. Through the 1960's, Yaou changed from radio manufacturer into full lineup home appliance company. In 1966, Yaou Electric changed their name to General Corp. But, General did not have enough supply chain in Japan and in early 1980's, their performance grew worse. In 1985, General was affiliated with Fujitsu Ltd. They became a home appliance division of Fujitsu. I think that Mr. Yau in your photo is family of founder.